Airbnb has gone from strength to strength, attracting big investment and touted for bigger profits. The success of other online marketplaces such as eBay, Etsy and even Hailo illustrate their huge potential for startups. They seem simple enough to set up, so if you have a good idea for an online marketplace you should be rolling in cash pretty soon, right? Here’s the problem: there are very specific attributes that an online marketplace must have to succeed. These alone will still not guarantee success, as the execution of even the best ideas is fraught with particular risks. In other words, good marketplace ideas are rare, and successful execution is rarer. Does your online marketplace enhance the experience offered to users? Airbnb offers plenty of “Wow” moments (wish lists, sorting accommodation by description etc.) that would not be possible in the conventional B&B marketplace. Will your digital marketplace confer advantages to user experience not offered by the conventional marketplace? Creating a marketplace that can offer economic advantages to both the customer and supplier is a big plus. In Gurley’s post he explains how Airbnb scored well on this: the price is made lower for the customer by allowing more suppliers to enter the marketplace. Are there economic advantages for suppliers and customers offered by your digital marketplace? This one should be a no-brainer. You need to leverage tech as much as possible to add to the “Wow” moments we mentioned. Airbnb, for example, allows users to check in/out and pay online, services that may not be offered by many conventional B&B’s. Will your digital marketplace be able to leverage significant additional benefits from technology? Is the market dominated by a small number of suppliers? This will hinder the success of your marketplace, and a fragmented supplier base is desirable. 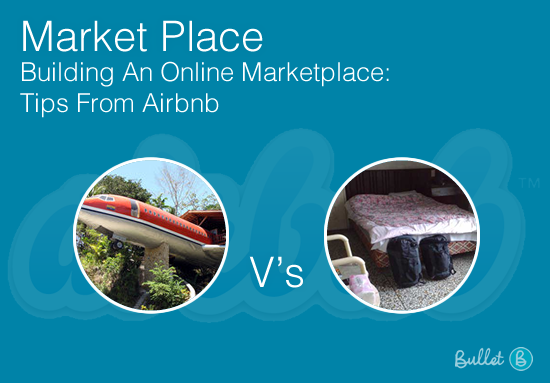 This is the beauty of Airbnb, anyone can enter the marketplace as a supplier (provided you have a house, of course). Will your digital marketplace have a concentrated supplier base? Some sites, such as OpenTable, will find it harder to sign suppliers up (to sign up to Opentable a restaurant needs to have a computer and internet connection). Airbnb, on the other hand, is much easier to sign up for. Will your digital marketplace involve a difficult supplier signup process, and are their any major barriers to signing up? How big is the potential market, and how big a chunk of it can you realistically penetrate? Don’t fall for the large market fallacy. Airbnb scored well in this regard. What is the total size of the conventional marketplace you intend to bring online, and how much of that market would resist going online? Will your digital marketplace expand the market in an appreciable way in comparison to the status-quo? Another no-brainer: the more market interactions that will occur on you site the better. You need customers and suppliers that use the product frequently and keep coming back. Airbnb have a “sticky” product that encourages loyalty. How long will the purchasing cycle be in your digital marketplace, and will your customers re-enter the market often? 9 How will you get paid? Gurley explains how it’s better to charge your fee as part of the market transaction, which softens the blow to the supplier. Fees appear more acceptable when they’re taken from the supplier’s payment, no one likes a nasty bill after the deal has been done! Where in the payment process will your fee be charged? Will more customers and suppliers make the market inherently more advantageous? Positive network effects mean that the more users you have, the happier they’ll be. Airbnb cracked this with their rating system, improving their service offering as more users sign up. Will your digital marketplace be able to leverage any appreciable network effects? Score your idea on these categories, and be honest. Gurley says you’re chances of success are a lot higher if you do well in 7 or 8 categories, if you’re 4 or below then you might be out of luck. Growing an online marketplace takes persistence and trust. Building a marketplace takes way longer than other startup projects. Ebay, Airbnb and Etsy all took the guts of 3 years to really take off. Momentum is key in a marketplace; suppliers and customers have to feel that they are better served on your site than elsewhere. If this becomes the case then the price of acquiring incremental users is reduced. Unfortunately, this takes ages. Boris Wertz has some advice on how to survive this long wait. If you truly believe in the viability of your idea then stick to your guns. Don’t pivot too early, it can take a long time to test your assumptions about your marketplace business-model. This makes cashflow of particular importance to digital marketplace startups: control your burn to lengthen your runway as much as possible. Airbnb found this out the hard way; with money running out they hatched an ingenious plan to sell Obama and McCain themed cereal boxes, which kept their dream alive. Trust can be a bit of a buzzword at times on business blogs, but it’s very relevant when it comes to online marketplaces. People won’t use your site if they think they might get screwed, it’s that simple. Ebay had their fair share of bad press around trust, and our friends at Airbnb have had their own problems too: the negative publicity from one incident was highly damaging to the brand. Make the users feel as safe as possible, uncertainty and economic exchange never go well together. Here are a few tricks that make your users more at ease, all of which have been put into practice by Airbnb. Online marketplaces are hard to get off the ground, so critically evaluate your idea before you go rushing in to it. If it still seems worth it, you’ll need a long runway to get going, and to build momentum you’ll need trust on both the supply and demand sides.